We have not been called Mobile Dewatering for 20+ years without good reason! We have the right Mobile Dewatering solution always available to suit your next project. Mobile means our equipment can go anywhere and Dewatering is what we specialise in! 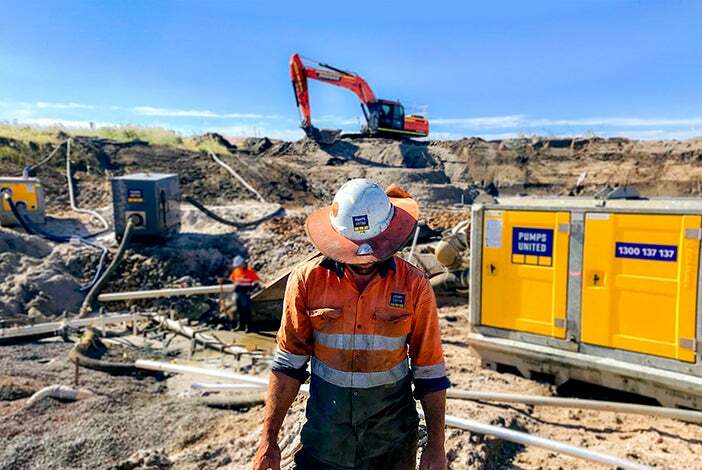 Mobile Dewatering have been the industry leaders for over 20 years and although we are now called Pumps United we are still the same leading Dewatering, Rental & Environmental companies in Australia. The union of Mobile Dewatering, Prestige Pump Rentals, MDW Environmental Services, Vortex Hire & Pressure Right provides to our clients the knowledge, experience and passion required to make your next project a success no matter the size. We pride ourselves on finding the best dewatering solution that will be right for you, whether it be something we already have in stock ready to go or something we need to custom build a solution to suit. We do not believe that one size should fit all so we will work with you to ensure we design a dewatering solution for your project that will deliver your specific contract and or compliance requirements. There isn’t a dewatering job we haven’t been able to resolve due to our extensive team of engineers, water treatment and dewatering experts. Give us a call today and lets us know what your project dewatering challenge is - we are confidant we will have a dewatering solution to suit.